The campaign of Illinois Democratic Senate candidate Alexi Giannoulias is going after the political group New Prosperity Foundation (NPF) for airing an ad making false claims about Rep. Mark Kirk's (R-Ill.) military service. The independent expenditure organization, however, says that the video was made public inadvertently and was never intended to be aired. "When Mark Kirk was serving his country in Iraq, Alexi Giannoulias was serving his basketball team in Greece," said the narrator in the ad, which has since been removed. "When Mark Kirk was making waves in Congress against deficit spending, Giannoulias was making bad loans at a bank that ultimately failed. And when Mark Kirk was standing up for job creators in Washington, Giannoulias was standing up with Rod Blagojevich. The New Prosperity Foundation approved and paid for this ad. 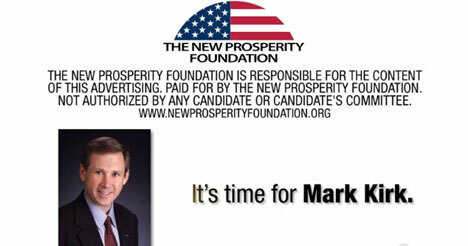 Because when it's time for experience, it's time for Mark Kirk." "Another ad, another lie about Congressman Kirk's military record and another day that he refuses to come clean and answer yes or no on whether he was shot at while flying over Iraq. That fact is he won't answer the question because he doesn't want to admit to another lie about his service," Giannoulias campaign spokesman Scott Burnham told The Chicago Sun-Times. The campaign pointed to an earlier statement by Kirk, in which the congressman said, "I have never served in Iraq as a military man, I have been to Iraq as a congressman, and then as part of operation Northern Watch, I deployed to Incirlik Air Base, Turkey, where we supported the no-fly zones, so we were flying over Iraq. But we didn't set boots in Iraq." A spokesman for the NPF told The Huffington Post that the video was posted accidentally. "The two videos regarding Illinois' U.S. Senate race that were posted on the New Prosperity Foundation website earlier today were done so inadvertently due to an internal miscommunication," he said. "They were produced in April 2010 as video story boards, they have never been aired as television ads nor were they intended to be posted on the website. We regret the error. The videos have been removed from our website." The incident highlights some of the dangers of having outside groups intervene in elections on behalf of candidates. While NPF is supporting Kirk, what happened today likely brought unwanted attention once again on Kirk's missteps on his military claims. As The Huffington Post has reported, NPF is a 527 group, meaning it can raise and spend unlimited amounts of money, including contributions from corporations. The group formed in late 2009, and so far, much of its funding has come a relatively small number of wealthy donors, several of whom were the so-called Bush Pioneers from 2000 and 2004. It has also aired against Democrat Julie Lassa in Wisconsin's 7th congressional district. 527s are prohibited from coordinating with campaigns or political parties. Even without explicit coordination, however, campaign finance experts say these groups' messages often closely follow what the establishment is saying. NPF's proposed line of attack against Giannoulias, for example, was similar to what the Kirk campaign was saying. "While Mark Kirk was running intelligence support for electronic attack combat missions in Operation Allied Force (Kosovo), Alexi Giannoulias was playing basketball in Greece," read a May 30 press release, referring to Giannoulias's time playing professional basketball abroad before being elected as Illinois state treasurer. "In brief, while Mark Kirk wore a U.S. Navy uniform, Alexi Giannoulias wore a basketball uniform in Greece."